The written sources that have reached us allow to detect direct traces of “Uechjism" far in the west, in the Aralo-Caspian region. It is the Yantsai country, records of which appeared after Chjan Tsian (Pinyin: Zhang Qian) return. The country Yantsai (< iam-tsai), the version with key hieroglyph No 53 yan “roof": Antsai (< *am-tsai)] is known since the time of Chjan Tsian (Pin. Zhang Qian) embassy, a full Biography of which is in the Tale of Daiuan-Fergana in the “Historical notes" text of Sima Qian, once lost, but later reconstructed from the materials of “Han History”.Therefore, the text about Yantsai in both works is repeated almost literally: “Yantsai is located approximately two thousand li northwest from Kantszüi (Pinyin: Kangju (康居) ), [their] battle-ready army [is] more than hundred thousand. [They] live by a large lake without shores, apparently, this is a Northern (in relation to Kantszüi) sea" [Sima Qian, ch. 123, p. 1138, f. 4а, Ban Gu, ch. 966, p. 1164, f. 17а]. Already in the first years after discovery of the Western territory, the Han imperial court applied to the Yantsai state importance level of Parthia, Datsin (eastern colonies of Roman empire), and India, which is stated in the description of the actions undertaken right after the victories over Hun in 121 BC: “In the beginning [they] opened the Tszütsüan area (in Gansu province) to link with the Northwestern states. Therefore [they] again sent embassies to Ansi (Parthia), Yantsai, Ligan (Datsin) and Shen-du (India) “[Sima Qian, ch. 123, p. 1142, f. 12а]. During that period were explored and stabilized the western routes of the Great road, and the Yantsai in the Aralo-Caspian basin took a key place on its Northern route: “The Northern road, after crossing Tsunlin (Pamir) toward the west, runs into Daiuan (Fergana), Kangju (Kangha) and Yantsai “[Ban Gu, ch. 96а, p. 1156, f. 16]. A few centuries later, the situation was presented differently. The author of the “History of Later Han, 25-220" Fan E, living in the 398-445, and thought of as having used the work composed by Üi Huan “Brief review of the Wei state, 220-265”,wrote: “The Yantsai state began to be called Alan-Liao, [its ruler] lives behind earthen (fortress) walls (Ch. tszüi di chen), and is dependent of Kangju. The climate and soil are warm, plenty of pine and feather grass. Customs and clothing of the population are identical with Kangju" [Fan E, ch. 88, p. 1316, f. 17b]. This text does not either directly, or indirectly state a settled way of life of all population of the country. By a strange misunderstanding, the Japanese scientist K.Siratori translated the expression “tszüi di chen" as “people live behind clay walls" [Shiratori, 1956, p. 226]. If that phrase had this meaning, it would have been placed lower, among the words about clothing and customs of the population, instead of the political characteristic of the state. Composing such information, annalists adhered to a standard scheme: 1. The name of the country. 2. A residence of the ruler and his characteristics. 3. The general description. The cited text meets this scheme. The expression “tszüi di chen" does not have words “people and clay”.The hieroglyph “di" in the combination “di chen" means: 1. Earth (planet), Earth globe, terrestrial, underground. 2. Country, state, territory. 3. Earth. It is even possible to conjecture that with the hieroglyph “di" in the primary text concurred the hieroglyph “tu" (deliberately compounded to avoid “tautology”,because it was used again one hieroglyph later in a combination “tu tsi" “climate and soil”)with meaning: 1. Earth, soil, dust, clay, earthen, clay-made, bitten-mud made, etc. With reference to the events of that period, a combination “tu chen" - “earthen/clay wall" is found in the description of a Hun Chjichji-shanyu fortress on the Talas river, which along with a wooden wall (mu chen) inside of it, was also enclosed with an earthen/clay wall (tu chen). That also means that in this case an identical designation described only a rampart or a wall around the court of the ruler, and not the homes of the country population. The “Brief review of the Wei state" (Wei lue), short quotations of which survived only as comments of a Sun scientist (southern dynasty Lu Sun, 420-479) Pei Sunchji to the Chen Show work “Description of three empires, 220-264”,contains the following lines about the Yantsai country: “Also is a state Lü, is a state Yan and still a state Yantsai, also called Alan. They all are one custom with Kangju. In the west [they] border Datsin, in the southeast [they border] Kangju. There it plenty of famous sable, they move with cattle in search of water and grass, [they] adjoin a large lake/bog, in the past [they] depended from Kangju, but nowadays are independent" [Chen Show, ch. 30, p. 411, f. 34а]. In a sense, a similar description of Asian Alans is given by Ammian Marcellin (XXXI, 2, 17): “Coming to a place rich in grass, they set their coaches in circle, and exhausting all forage for cattle, they again carry their, so to say, cities, located on wagons. On them the men mate with women, on them are born and brought up children, these are their permanent homes. Driving in front of them harnessed animals and their herds, they graze them, a greatest care they display in caring for horses”. In Siratori opinion, transcription Lu (< liəu) reflects the Volga name Rav (in Mordvinian ravaksh “inhabitants of Rav, i.e. of Volga”), they were Finno-Ugrian people along the middle course of Volga. Probably, the Avesta storytellers also heard about these places (Vendidad, 1, 20, 76-78), calling them “countries on the banks of Ranga (Ra) waters who do not know authority of rulers”.Transcription Lu is practically identical with Liao (< liəu) in combination Alan-Liao. Alan is Alans, who occupied from the turn of our era the area from the coasts of the Aral and Caspian seas to Don, including Northern Caucasus and Black Sea Coast. The existence of binomial Alan-Liao, besides a common dependence of both peoples from Kangju, testifies that they had internal links, but apparently discoursing about them is yet too early. Probably, they were relations of hierarchical interdependence, in which orbit also was the Yan (< ngiam) possession, located, as thought Siratori, in the Kama river basin, the left tributary of Volga. About the Yan, the “History of Late Han" said: “State Yan is in the north from Yantsai, it depends from Kangju. From there come sable pelts" [Fan E, ch. 88, p. 1316, f. 17а]. The real term hidden behind the transcription Yantsai (< iam-tsai), or as in “History of Chjou”,Antsai (< am-tsai), is not solidly established. Still F.Hirth and A.Gutschmidt, and relatively recently (with a question mark) E. Pulleyblank identified Aorses with Yantsai, following the important role of Aorses tribe in the Aralo-Caspian area noted in the ancient sources (for example, Ptolemy, VI, 14) [Hirth, 1885, p. 139, Gutschmidt, 1888, p. 69, Pulleyblank, 1962, pt. 1, p. 99]. J.Marquart thought they are Massagetes [Marquart, 1938, p. 65]. Tsen Chünmian and K.Siratori, who earlier held to a different view, identified Yantsai with Kypchaks [Tsen Chünmian, 1958а, p. 670]. O.Maenchen-Helfen and H. V.Haussig saw in transcription Yantsai one of designations of White Huns Ephtalites [Maenchen-Helfen, 1945, p. 250, Haussig, 1953, p. 321]. The now lost composition “Han tu tsze-gu" (Interpretation of the text of “Han History”), quoted in the comments to the “Historical notes”,said that “Yantsai is Hesu (< γap-sou)" [Sima Qian, p. 1138, f. 4а]. Probably, in antiquity all three cited transcriptions were thought to reflect the phonetics of the same word. Moreover, the third transcription was used independently, and it was perceived as ordinary. So, the Biography of Chen Tan said that N.Hun shanyu Chjichji, then serving under a flag of the Kangju ruler, collected an annual tribute from the Hesu and Daiuan states [Zuev, 1957, p. 68]. An early commentator Yan Shigu cites the composition of Hu Guan: “Approximately one thousand li north from Kangju is Yantsai state, its other name is Hesu. That means, Hesu is Yantsai" [Ban Gu, ch. 70, p. 857, f. 4а]. Siratori and Teggard, and the writer of these lines, believe with sufficient reasons that the noted variations reflect the name mentioned by Pliny the Elder (23-79) Sarmato-Alanian tribe Abzoy. Here is Pliny the Elder judgment about the peoples living on the banks of the Scythian gulf of the Caspian sea: “On this side (i.e. the western side) live nomads and Sauromats under many separate names, and on that side (i.e. in the east) live Abzoys with not a smaller number of names “(Pliny, V, 36). L.A.Matsulevich wrote “Apparently, under Abzoys and Arzoys in Pliny statement, including numerous tribes, should be understood those “upper, i.e. foothill, Aorses" who, as stated Strabo, “possessed extensive country and dominated, can be said, the greatest part of the Caspian coast so that they even traded in Indian and Babylonian goods" [Matsulevich, 1947, p. 132]. The term Yantsai/Antsai/Hesu/Abzoya is a politonym, substantially synonymous with the term Sarmatian, and in turn, Aorses (compare Avest. aurusa “white”)whom Ptolemy in the sixth book of “Geography" places near a “great race" of Syrdarya Yaksarts, also were simultaneously Abzoys, and Sarmatians of the Asian Scythia, or of the Asian Sarmatia. Speaking about S. Caucasus trading connections of the Aorses, Strabo does not mention the eastern part of the Trade Road (Northern route), in which orbit were Fergana, Kangha, Abzoya and (even in the Chinese records) the Volga region. It should not be taken that in the Chinese sources understood the country Yantsai exclusively as a location around the Aral Sea. The Chinese sources give an image of all the huge territory of the Sarmato-Alan pasture territories, though it is undisputable that the eastern and northern Aral area were most known to the Chinese [Tolstov, 1947, p. 75, 1948, p. 20]. The Northern road with its branches extended on a continental scale, and Yantsai/Abzoya held an appropriate place in its operation. From the available written records, no significant city type trading or craft centers existed in the Yantsai country, if not to accept for those the forts “with earthen/clay wals" of the Abzoy ruler, or mobile cities of felt yurts on wagons described by Ammian Marcellin. Nevertheless, to the middle of the 7th century belongs a distinct message that a commandery of the former Yantsai country was in the city Hulu (< γuo-luo) [Ouyan Sü, ch. 43b, p. 301, f. 9а]. No other news about it could be found [Malyavkin, 1989, p. 267]. It should be noted that the transcription of Hulu is explanatory, and its hieroglyphs read “Sogdian road”,from which follows that the city stood on a Trade Road, and the operatives of the road were Sogdians. In the “Tang's review" this city is called: Sogdian city of Hu-chen [Tsen Chünmian, 1958а, p. 145]. This information is positively complemented by other sources, in particular, by a 982 Persian geography book “Borders of the world”,based on an earlier Arabic original. The transcription conjuncts with the name of city Hvara on the Lower Syr-Darya. In the section of the “Maverannahr borders and its cities" it says: “Djend, Hvara and Dih-i Hay ("New settlement”)are three cities on the bank the Chach (Syr-Darya) river. From Khoresm ten post stations, from Farab twenty post stations. The king of Guzes in the winter stays in this Dih-i Hay" [Minorsky, 1937, p. 122]. The localization of the named points is problematic, though it is clear that all of them were located on the Lower Syr-Darya. In another place of the same composition this river, leaving the limits of Chach, passes Sutkent, Farab (Otrar) and numerous small towns to the limits of Djend and Hvar, and runs into the Khorezm (Aral) sea [Ibid, p. 72]. Hvara was at the western extremity of Desert ("Sand”)to the east from Aral: “The other Sand lays between Kimeks and limits of Djend and Hvara. Its extent is huge... “[Ibid, p. 81]. Researchers agree that Early Medieval Djend was located on the Lower Syr-Darya, and identify it with the ruins of Djan-kala. The ruins of Yanga-kent (Dih-i Hay) under a name Djan-kent lay on the left bank of Syr-Darya south from Kazalinsk. The Hvara site is not established yet, though it should be noted that in the Baghdad edition of al-Idrisi maps (mid 12th century) the river Chu (Ruza, al-Idrisi thought it ran into the Aral Sea) is placed northeast from the river where the city Hvaran (in the text: Hvarat) is located in the lower course [Agadjanov, 1969, p. 66]. Ammian Marcellin (XXII, 6, 63) also mentions until the last quarter of the 4th century the city of Hvarana, and also in a city triad of the Lower Syr-Darya, but with another names of two other cities: “From the cities only three are known: Aspabota, Havrana and Saga... “In Ptolemy (VI, 15, 3) “Geography" under a name Havrana is recorded a city far in the east, beyond Kazi (Eastern Tien Shan) mountains, Khata (Ch. Sütu) Scythians, between the Akasa area (Ch. Eshi) and Emod (Ch. Tsilyan (Qilian)) mountains, in the land of Khavran Scythians. The name of Khavran Scythians finds a direct conformation in the Chinese transcription Khun-e (< γuən-na), which usual presentation of the transcriptional final -n of the original -r precisely conveys the word Khvarana/Khavrana. It accordance with the Han’s chronicles, in the middle of the 2nd century BC the Hunie/Hvarans occupied Uechji (Pin. Yuezhi) possessions in the Chjanie-Ganjou and Tsziutsiuan districts north from the Tsilyan (Qilian) (Nan Shan, Richtgofen ridge) mountains in the territory of the modern Gansu province [Malyavkin, 1989, p. 205]. Possiblyly, it was the Uechji (Pin. Yuezhi) dynastic tribe that after the fall of the Uechji (Pin. Yuezhi) state fell under the Hun rule, and automatically became “Hun”. Hun's defeat of Uechji (Pin. Yuezhi) (Uti/Ati/Asi) in the 172-164 BC forced migration of significant part of them to Central Asia. It was not limited to the “storm" of Greco-Bactria, their main part remained in the newly found motherland, including the basin of the Syr-Darya and the Aral area. In the second century, at least three hundred years after the beginning of their migration, Ptolemy (VI, 12, 4) wrote about the Lower Syr-Darya: ”... near a section of Yaksart in the north live Yati and Tagors, belower which live Augals”. The Sakaraul of the Strabon work (XI, 1, 2) was attempted to be compared with the name Augal [Haloun, 1937, p. 244], even though Gutshmidt and many authors after him (Shventner, Tarn, etc.) saw a deformed by copyists name of a Scythian tribe Sakarauka, mentioned by pseudo-Lupin, Orosi and Ptolemy, in the Strabon Sakarauls [Gutschmidt, 1888, p. 71-72]. According to the V.Tarn's concept, which B.A.Litvinsky with some reservations deems to be the most probable, the native land of Sakarauks was the Aral area [Tarn, 1951. p. 279, 291, 534, 1972, p. 172]. E.A.Grantovsky links the second part of the ethnonym with a reflection of the Iranian rauka “light”,making Sakarauks “light Sakas" [Grantovsky, 1975, p. 79]. There are also other points of view [Kuklin, 1985, p. 108-110]. S.P.Tolstov, relying on graphically deformed variation Augas (Instead of Augal), considered possible to link it with the term Oguz, and on this basis he created a concept about the origin of the ethnic name Oguz ("river”,"bull”), and the Oguz yabgu state with capital in Yangikent on Syr-Darya [Tolstov, 1950, p. 50]. A.N.Kononov on this occasion wrote: “Accepting S.P.Tolstov suggestion leads to reconsideration of all based on historical facts ideas about the origin and ethnic structure of Oguzes “[Kononov, 1958, p. 83]. The Augals are not identical neither with Sakaraukas, nor Oguzes, but they are historical, although the Greek record of the ethnonym incompletely relays its real sound. By the middle of the 1st century BC in the Hun confederation in the Mongolia territory actively grew centrifugal ambitions of the rulers of five small “states”,subordinated and incorporated by the Hun in the past. One of them was a leader of Hu-tsze tribe ruling “in the western side" (< huo-g'iat/kiat), Hutsze-van, who proclaimed himself a shanyu and managed to “separate”,gain independence [Ban Gu, ch. 94b, p. 1128, f. 1b]. The Chen Tan Biography in “Han History" spells that in 49 BC the Chjichji shanyu, a leader of the northern Hun, took control of the Hun western territories, and then, mindful of Han and southern Hunnu intervention, “defeated at once three states in the west, Hutsze, Tszyankun and Dinlin" [Ban Gu, ch. 70, p. 6 a-a]. The geographical pointers of these messages can only be understood in a case if a mistake was made in the text of the annals, and instead of the “western territories" should be understood the “eastern territories" in the Inner Mongolia. Only from the Inner Mongolia Chjichji shanyu could defeat “in the west" the Minusinsk “Tszyankun" Kirgizes, the Baikal Dinlins and, as wrote one of the ancient commentators, “a small Hun Hutsze state in north”.Therefore, the Description of Hun of the same chronicle says: “In the north he attacked Utsze. [The ruler of the state] Utsze submitted. With the forces of his army he defeated in the west Tszyankun, and in the north subdued Dinlin. Tszyankun was 7 thousand li west from the shanyu court" [Ban Gu, ch. 94b, p. 1130, f. 5 а-b]. The transcriptions Hutsze and Utsze (< uo-g'iat/kiat) are of the same order, they reflect the original ethnonym Uokil/*Uogil. Dinlins, near whom Uokils lived in the Baikal area, were possessors of “high wagons" Gaoche (Khocha, Tochars) [Li Yanshou Ch. 98, p. 1312, f. 23а]. It can be assumed that Uokils in the Baikal area also belonged to Gaoche (Khocha, Tochars). The traces of ethnonym Uokil are found in the East Mongolia and Manchuria territories during Syanbi, ancient Türkic, and Mongolian time. Far in the west, between the Danube Bulgars of the eighth century, the Uokil (Vokil) clan was one of the dynastic clans, whose ancestors “ruled on that side of Danube for 515 years with shaved heads" [Josef Benzing, 1986, p. 15-16]. On the Central Asian soil the ethnonym Uokil/Vokil/Augal probably left its trace in a name of the legion leader as forty Vekil in the Oguz epos “Kitab-i dedem Korkut”. That is the ambient ethnography of the early Yantsai /Abzoya. It is known now about the Yantsai state that the main section of the East - West Trade Road crossed Yantsai territory, the Yantsai section was called Sogdian road, and after reaching Volga - Ra the road branched in three directions: to the south to the S. Caucasus, to the west to the European countries, and to the north to the Kama area. In the Middle Asia, the last transit point on this road was Yantsai city of Hvara/Hvarana in the Syr-Darya estuary, called a Sogdian city in Chinese. Far in the east, at the source of the Trade Road, also existed a city of Hvarana and a Scythian tribe Hvarana. Supposedly, Hvarana was at some time a “royal" tribe of the Uechji (Pin. Yuezhi) (Ases), which fell into the Hun political sphere of influence, and received a political designation “Hun”.A significant part of them migrated to the Middle Asia, including the Aral Sea coasts. This capitulation is needed to understand the chronologically latest information in the Chinese annals about the Yantsai state. In reconstruction of the text, lost in antiquity, of the Wei Show “History of Toba-Wei, 338-534”,the paragraph in the “History of Northern dynasties" about the Suté (siuk-d'ək) state with latest information about the Yantsai state was used almost without changes. “The Suté (Sogdak) state is west from Tsunlin (Pamir), in antiquity it was called Yantsai, its another name was Wennasha. They live near a large lake/bog northwest from Kangju, 16 thousand li from Dai (capital of Toba-Wei, modern Datong). During the former times Hun killed their king, and took hold of their state. By the time of the king Huni, three generations have already passed (or: king Huni was already a third generation) after that event. Before, merchants from that country came in multitude [to the Northern state] Lian (397-460) to trade goods. When Wei dynasty (338-534) has overcame Gutszan (Kochan, capital of Northern Lian, 439) they all were captured. In the beginning of the Wen-chen period (452, “Wei shu": “In the beginning of the emperor Gao-tszun rule, 432-465”)Suté king sent an envoy requesting their ransom, which was granted by a decree. After that, no embassies with gifts came. In the fourth year of the of Bao-din period (564), during Chjou dynasty (557-581), their king sent an embassy with a tribute of objects of local manufacture" [Li Yanshou, ch. 97, p. 1293, f. 16а, Wei Show, ch. 102, p. 1319, f. 15а]. The first lines of the text that Suté (Sogd in the basins of the rivers Zeravshan and Kashkadarya) and Yantsai (Aral area) are the same caused a bewilderment and resolute rejection by the traditional Chinese commentators and some modern researchers [Tszyan Botszan, et al. Lidai..., I, p. 651, Enoki, 1956, p. 46-47]. The matter is, located on the Sogdian caravan road and inhabited by Sogdian traders and craftsmen, the city Hvarana was also [called] Sogd and Sogdak, just as Sogdak (modern Suzak) was the name for the Sogdian trading town in Crimea, the Sogdian city-dwelling population of the Jeti-su was Sogdak, six districts - chjou (Ch. lu hu chjou, Türkic, alty chub Sogdak) right in the beginning of the 8th century in the the land of the Sogdian colonies in Southern Ordos were called Sogdak Northern Shaanxi. The compiler of the “History of Northern dynasties" Li Yanshou could not take into account this fact, because he know only the Sogd with a center in Samarkand, but he still documented the Yantsai description. Contradiction in identification of two different states alerted Linghu Defen, the compiler of “Chjou History" who, repeating in a short footnote the identification made by Li Yanshou, wisely added to it a delicate “maybe": “Suté State is located west from Tsunlin (Pamir), maybe, it is Antsai (sic!) of antiquity, its another name is Wennasha. The center is near a large lake/bog (Ch. tsze), located northwest from Kangju. In the fourth year of the Bao-din period, their king sent an embassy to present objects of local manufacture" [Linghu Defen, ch. 50, p. 431, f. 15а]. O.Maenchen-Helfen generally rated the text of “Chjou History" closest to the original, which in his opinion was the work of Kan In “Shi-san chjou chji" (Description of thirteen districts, ca. 430), which compiled direct questionnaires from the merchants and envoys from Central Asia [Haloun, 1937, p. 275-277, Maenchen-Helfen, 1945, p. 229]. Whether O.Maenchen-Helfen is right or not, the text of the “History of Northern dynasties" in that part is a record of a direct oral historical tradition, and it would be senseless to rely on the chronological coordinates given there ("three generations”)without a point of time reference. The “other name"of the Wennasha country is not any more mentioned anywhere. The versions of its reconstruction, to some extent based on liberal reading of the transcription Yantsai (Ephthal, Ephthalite-Khionite), are speculative and cannot be considered satisfactory. Only the remark of Siratori, that the first hieroglyph in the compound Wennasha (Wen) is a proper name [Shiratori, 1928, p. 98] could be productive. It was supported by H. V.Haussig, who noted that in accordance with the “Tang History”,the leaders of “nine Arsi tribes" (Ancient Turkic Tokuz Ersen) descended from the clan Wen, and were the heads of eight city-states in Sogdiana [Haussig, 1953, p. 415-418]. In that part the quixotic construction of Haussig about “nine Arsi tribes" can be ignored, because such tribes never existed. The ancient Türkic word ersen ascends to the to old Indian rasayana “spring”.The combination Tokuz ersen ("Nine springs”)is a name of an area, an end point of the ancient Türkic campaigns in the south, and in the first half the 8th century (”... I went with armies south down to Nine springs" - KTm, 3), and a calque of the Chinese name for the extensive territory of modern autonomous province of the Inner Mongolia on the left bank of the northern bend of Huang He, Tszu-yuan ("Nine springs”). It is thought that the name Arsi people, ostensibly found in the Eastern Turkestan documents, also never existed [Tarn, 1951, p. 284]. In the same chronicle, Li Yanshou defines the surname/clan Wen as a part of the Uechji (Pin. Yuezhi) tribe: “King (of the state Kang) [comes] from the surname/clan Wen, he is an Uechji (Pin. Yuezhi). Before, they lived north from Tsilyan (Qilian) mountains in the city of Chjao'u. When they were defeated by Hun, they crossed the Tsunlin (Pamir) in the west, and took hold of that country" [Li Yanshou, ch. 97, p. 1298, f. 25b]. This version is repeated in the works of Wei Show, Wei Chjen, Lü Süi and other authors [Wei Show, ch. 102, p. 1325, f. 26b, Wei Chjen, ch. 83, p. 826, f. 8а, Lü Süi, ch. 198, p. 1483, f. 13b]. It reflects a known scheme of Uechji (Pin. Yuezhi) migration to the west after the murder of their leader by the army of the Hun Laoshan-shanyu in the second century BC. Its variation is reproduced in above mentioned lines about Abzoy's Sogdak in the Aral area: “During erstwhile times, Hun killed their king, and took hold of his state. King Huni was already a third generation after that event”.Following precisely the internal logic of the text, the count should start approximately from 164 BC (murder of the Uechji (Pin. Yuezhi) leader) and according to it should resolve the problem of the real proto-type of the transcriptional hieroglyph Wen (<*uən). The phonetic laws discussed above lead to the Scythian and Avestan word hvar “sun”.In the same key is reconstructed the name of the cited above mythological, Uechji (Pin. Yuezhi) by descent, king Huni (< khuət-neh < hvarnah), Hvarna/Hvarana as an emanation of the Sun and divine fire, a giver of divine nimbus of the kings [Toporov, 1992, p. 557-558, Litvinsky, 1968, p. 48-49, Akishev, 1984, p. 37-38]. 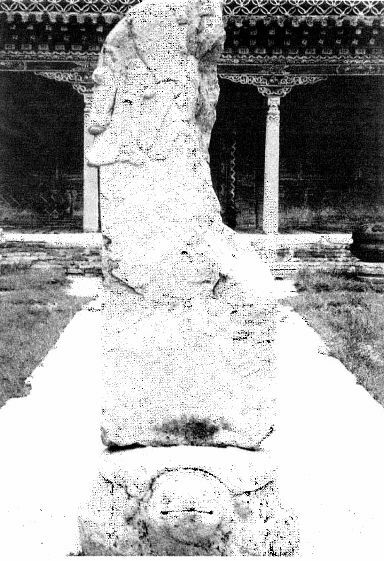 K.Siratori's opinion that the hieroglyph wen reflected proper name is fair only in relation to the clan affiliation of the Wen/*Hvar Sogdiana ruler in Samarkand. This surname really existed among Uechji (Pin. Yuezhi) in the Han time [Wei Chjen, ch. 83, p. 826, f. 8а, Tszyan Botszan, et al. Lidai..., I, p. 382], it was a reigning family. The same hieroglyph is used as the first sign in the transcription of the compound Ven-na-sha and, hence, reflected the same initial “Sogdian" phonetics *Hvar. Judging by the above material about the Hvarana (Hvarəna) city and tribe, it is not separable from the following hieroglyph na, and together they create a transcription for the word Hvarna/Hvarəna. With the word representing the name of the country or its capital city, the final sign sha is confidently accepted as an incomplete transcription of the Persian shahr “country”,"city”,i.e. a full “alternate" name of the Abzoya was Hvarna-shahr. The eastern connections of Yantsai/Abzoya allows to specifically present the timing of Asii or Ases (Uechji (Pin. Yuezhi)) penetration, and of their “royal" solar clan Hvarana, into the Aral area. It can be followed further on. In the 576 a Byzantian embassy was sent to the western Türks, to conclude a military alliance against Persia. It traveled by the northern route. Crossing Itil and Yaik, on the northern coast of Aral they came to the possessions of a queen Akagas, whose reign was awarded by Anagai, a king of the Utigurs [Chavannes, 1903, p. 240]. The king Anagai was known to the Chinese under a name Anaguai. He was a Kagan-emperor of the huge Avar confederation that terrified peoples from Manchuria to the Cimmerian Bosporus, but fell from the blows of the Türks. Anagai committed suicide in the 552. As a supreme ruler of a large number of subjugated tribes, he was a guarantor in preservation of the existing order within the controlled areas, and his “appointments" formalized the existing status. The territory of the Utigurs, alongside with the Aorses in the Aral area, was just one of such territories, which name under a pen of a Byzantian writer was transformed into a name of the queen Akagas. The Utigurs of this message (J. R. Hamilton identifies this name with the name of a tribe Utiger in the Rashid ad-Din list of nine Uigur tribes) [Hamilton, 1962, p. 35, 38, 42] are mentioned by Pliny (VI, 39) as the Uti tribe, associated with Aorses. E. Pulleyblank identifies Uties as Uechji (Pin. Yuezhi) tribe [Puleyblank, 1966, p. 18]. There are parallel records about Uechji (Pin. Yuezhi)/Uti far in the east, in the basin of the Edzin-gol. The first message about them narrates that in the 413 the ruler of the Northern Lian state, after leaving Tyaotyao district, sent a ten-thousand army against barbarous pastures of Bihe and Uti [Fan Süanlin, ch.. 129, p. 852, f. 5а]. The second military campaign against Uti took place in three years, it was connected with sacrifice on the Golden mountain Tszinshan and in a temple of the Uechji (Pin. Yuezhi) Queen-mother of the West Si-van-mu, and on the way to which the Lian army had to pass the Western sea Sihai and Salty lake Yanchi. In the temple was an image of goddess Si-van-mu made of a black stone. Mensun ordered to write an ode and carve its text on a rock [Ibid, p. 853, f. 6а]. The basin of the Edzin-gol was Tszüyian-Eshi (*Kuyan-Aksa) area. Ptolemy (VI, 15, 3) placed the Scythian area Akasa immediately next to the solar Scythians Hvarans. We repeat, the features of the Uechji (Pin. Yuezhi) queen goddess are similar with the Asia Minor image of the goddesses Great Mother Cybele, shaped as a silver statue with a face carved from rough black stone, and placed in a sacred wagon near a pond [Frezer, 1983, p. 330]. Details about eastern Uechji (Pin. Yuezhi)-Uti, Akasa area and queen-mother allows to fill with specific contents the image of Scythian Uti (Utigur) queen in the Northern Aral area. The names of the eastern and Aral areas Akasa/Akas/Akagas go back to the Scythian word akas “undamaged”,"whole" [Abaev, 1979, p. 277]. The existence of two areas, Hvarana ("Solar" и “king's”,in the Southeastern and Eastern Aral area) and Akas ("Lunar" and “queen's”,in the Northern Aral area) was to a certain extent inherited from Uechji (Pin. Yuezhi) of the East, but doubtlessly it was fed by a local Sarmatian gynocratic environment. The dualism of cosmogenic ideas was parallel to the duality of the Yantsai society and “solar-lunar" dynastic co-rule in the state. This is why in the Book 6 of the Ptolemy “Geography" the Asman tribe is placed on the lands east from the river Ra (Volga). The above material, a significant part of which is brought to light for the first time, unconditionally testifies that Yantsai/Abzoya was not a marginal remote area, but a large and fully fledged state type confederation in the territory of the modern Kazakhstan. The Chinese record of the Kypchak historical-genealogical legend is found in the text of a monument to the Kypchak military leader Tutuha from the clan Üilibeili, compiled by Üi Tszi (1272-1348), and included in the “Yuan wen lei" collection [Su Tyantszue, ch. 26, p. 329], in the Yan Fu work [Ch. 3, f. 17а], and in dynastic history “Yuan shi" [Sun Lian, ch. 128, p. 1486, f. 14а]. It was repeatedly reproduced in compositions of the later Chinese authors [Ke Shaomin, ch. 29, f. 506-516], it is also known in English [Bretschneider, 1888], German [Marquart, 1914], French [Pelliot, 1920, Pelliot, Hambis, 1951] and Russian [Kychanov, 1963, Kadyrbaev, 1982] translations. Its interpretation are in the Chinese and European historiography. The time of its recording is not earlier than the first half of the 14th century. More than a century-old tradition of its study brought results of variable importance. Without a doubt was only established that the primary action scene of the text heroes was Djeiran valley (Ch. Chjelyan-chuan, Mong. Djeren-ke'er) north from the Loha-muren river in the Inner Mongolia, and the end point of Tsincha-Kypchak migration was interfluvial of Volga (Itil) and Ural (Yaik). Also, was made a number of successful terminological reconstructions. However, the mnemonic in the character material of that short legend in its mythological part is considerably the richer. It is suitable for decoding, and it appears it can form a basis for several significant conclusions. The text is cited from the version of Üi Tszi. The transcriptional identification of S15408, 3891 Andahan mountains corresponds to the Altahan (< Mong.-Khalh. alta, Mong.-writtem. altan “gold”). The propriety of reconstruction anda < alta is confirmed, in particular, by the case of use of that transcription to render the name of Tumet Alta-khan (Altan-khan) (1567-1582) in the Mongolian and Chinese annals respectively [Shastina, 1957, p. 191, Chjan Tinyui, ch. 17, p. 141, f. 36, Pokotilov, 1893, p. 150]. The name of Altahan mountains is recorded in the Mongolian annals. According to one of the versions in the “Altan-tobchi”,the remains of Chingiz were buried in the Great Utuk behind Altahan mountains, on a southern slope of Kentei-khan mountains. In the views of the early Mongols, Altahan (Alta-kan) mountains were compared with high and warm female breast. The same annals quote the words of Korulat Tsebden, who unsuccessfully married his daughter Alta-khan (Altahan?) to the Mongolian Taisun-khan: ”... Before, the back of Altahan mountains was warm, why now it became cold? The breast of my daughter Alta-khan before was cold, why now it became warm? “[Gomboev, 1858, p. 148, 164, 174]. Probably, the Mongolian designation of Golden mountains ascends to the Türkic name of the mountains Altunkan/khan (Altunhan? ), where happened a meeting of Black prince Shu's troops with soldiers of the Zu-l-Karnein (Alexander Macedonian - Translator's Notes) [Kashgari Mahmud, 1, p. 117, Ancient Türkic Dictionary, p. 40]. Their Chinese parallel was С583, 10702 Tszinwei “golden”,"gilded”.In the 1st century AD beyond the Tszinwei mountains was Urpen area (Ch. С12711, 10523 Üeban < iwat-pan), where was the court of the northern Hun Shanuy (see below). An echo of that can be found in the Kypchaks living near the Altyndy-tau mountain in the Kazakh epos [Koblandy-batyr, 1975, p. 149, 151, 155, 310, 312, 316, etc.]. Other key point of the legend is the Upin area. Its full historical-geographical characteristics is given in the description of the Mongol Kartsin (Harachin) aimak territories in the “Mengu umu tszi" composition. During Hou-Han dynasty (25-220) it was a land of Syanbi, during Tszin dynasty (265-420) Muzhun tribes, during Yuan-Wei (384-532) it was owned by Kumo-si, during Tang dynasty (618-907) by Jaole-dudufu, in the 1007 there was established district Da-din of Chjun-tsing province, renamed in the 1270 to Upin province, in 1287 it again was called Da-din [Men-gu-u-mu-tszi, 1895, p. 12, 196]. The district Upin was on both banks of the Loha-muren (Laoha-he) river, and the ruins of the city Upin survived in the Botatszy district [Pelliot, Hambis, 1951, p. 96]. The Altahan mountains are Big Khingan north from Loha-muren, the right tributary of the river Shar-muren (Huan-shui). In the east from the Great Khingan is a valley of nowadays drainless Dzeren river [Murzaev, 1955, p. 156], the Djeren ke'er of the above legend. Thus, are determined the southern, eastern, and western limits of Kypchaks in the Inner Mongolia. In respect to the Gold (~Golden) mountains in this part of Asia, Van Govej has come to a conclusion that Great Hingan's other traditional designations were Tszin-shan (Golden mountains) and Kara'un-chidun (Black cart) [Van Govej, 1959, III, p. 725-730]. Under the year 1288 it is stated that Kypchak leader Tutuha [Pelliot, Hambis, 1951: tutγaq “mounted night patrol”;Golden, 1986-1987, p. 8-7: toqtaq], returning from a raid, approached the Kara un, crossed the river Guiler, defeated a mutinous prince Katanu and, completely capturing the tribes Liao-Kidanes, established tumen seat Dun-lu (East province) [Sun Lyan, ch. 128, p. 1487, f. 166]. Djeren-ke'er belongs to this province [Sun Lyan, ch. 100, p. 1250, f. 3 a]. With a known phonetic transposition n/y (y like in York - Translator's Note) (for example, *hanaγ~ayaγ “honour”;aniγ~ayiγ “bad, awful”;qanu~qayu “what?”,-qina-qiya denuminative affix; and also in the initial and final positions: Yama~Nama a name of a god; yemek~nemek a name of a tribe; qon~qoi “sheep”;qitan~qitai a name of people) [see also: Gabain, 1950, p. 53; Bazin, 1950, p. 289-290], the name of the mythical pra-genitor Kunan corresponds to Kuian (魁岸 ? ), an ethno-toponym of the Uechji (Pin. Yuezhi)-"Tocharian" origin with a meaning “white (downpour/stream, Milky Way from Turkic kuu - “white”)”.The Chinese translation of this term was С2658, 2690 bai-si (bai-xi白霫)“white torrent" or simply si “torrent/stream”. In ancient Türkic time the tribe or tribes with such Chinese designation existed on the eastern slopes of Great Hingan along all its extent from the Loha-muren to the northern spurs. In this region the tribes С2690 Hi (霫) and С8497 Si (Xi 奚) (< yiei < haj~qaj) lived commingled, and that found a reflection in the written sources. They were designated: С8497 Hi (奚) (Kai) - С2690 Si (Xi霫) ("downpour”) [Tsen Chünmian, 1958, p. 612; E Lun-li, 1979, p. 313; Men-gu-u-mu-tszi, 1895, p. 194]. The area Da-din of the Chjun-jing province was already discussed above. “The district of Da-din (on the southern bank of the Shara-muren river), says the chronicler, are former lands of a tribe Bai-si “[Toto, ch. 39, p. 182, f. 1b]. In another place of the same work he informs: “С8497 (奚) Hi - С2690 (霫) Hi is a name of the state on the Chjun-jing lands" [Toto, ch. 116, p. 514, f. 12а]. The state Hese (Kai + “downpour”) the Türks call Dad-pyi, says Uiguro-Tibetan official report of the 9th century [Bacot, 1956, p. 145]. The reference to Tatabi nation in the Large ancient Türkic inscriptions of Northern Mongolia [Ancient Türkic Dictionary, p. 541] also belongs to this area (compare Iran. *tata api, Avesta tata apo “falling waters”). With reference to this area and Si ("stream”)+Hi (Kai) confederation, as evidence of the connection with Tochars-Kocha can be viewed its designation С4304, 13770 kuchjen (< k'uo-tsien < *kuchin; compare kuchinne “Kuchanian" in the bilingual Türkic-Tocharian text) [Winter, 1963, p. 249] in the etnonymic combination Kuchjen-Hi (< *kuchin-hai). According to the New edition of the “History of Tang dynasty" it becomes known since the time of the Yuan-Wei dynasty (386-534) and existed till the Sui epoch (581-618). In relation to them, is applicable the definition found in the same text “possession of two barbarians”, also called Kumo-Si (庫莫奚) [Ouyan Sü, ch. 219, p. 1538, f. 4 b; Taskin, 1984, p. 148, 369]. The first part of this binomial С4304, 8428 (庫莫) Kumo (< k'uo-mak < qumaq ~qumaγ) is perceived as a calque of the Turkic qum “sand”, "desert”, recorded in the folk etymology of the term Kuman, preserved in Rus annals: “Cumans called Polovetses come from desert”. The Mongol-lingual populace of the Great Hingan also knew that, and had appeared its Mongolian calque qumaγ. But in this case, this word does not have a meaning. The above polyglot material is brought by the objective necessity to reflect that in antiquity and Middle Ages this region was a zone of active ethno-linguistic interchange, and historically sequential transformation of ethnic masses (Uechji (Pin. Yuezhi)-"Tocharian”, and Iranian - Turkic - Mongolian). In the process, the main elements of the former cosmogenic beliefs were changing, handed down, and sometimes preserved a part of the previous contents and its lexical expressions. The term kuyan was one of the main cosmogonic symbols of gynocratic seven-tribe Uechji (Pin. Yuezhi)-"Tochars”,who were worshipping a Moon deity. Kuyan was the queen surname of the Hun and Syanbi. Hionites-Ephthalites were called “White”. The tutuk commanderies, which alongside with other Türkic-Oguz tribes controlled “high" Edizes, were called Khuyan, and Edizes, who became a queen (katun) tribe in the First and Second Turkic Kaganates, lived in a valley of the mountain river Khuyan (Ch. Khuyan-gu). After accepting Manichaeism in the first quarter of the 7th century, they received new names Ashtak, Shir and Arslan. Kuyan (~kuyin) was the name of the “White Tatars “of the East Mongolia in the 12th-13th centuries. Kiyan (~kyian, Mong.pl. kyiat) became a name of the royal clan in the Mongol state. Recording foreign ethnonyms or important concept, the ancient Chinese bureaucrats tried to follow to a possible extent the Confucius principle of accordance of the name with its meaning. To transmit the sound of a foreign word were selected hieroglyphs which would contain information about the people or a concept, though it could have no relation to the specific meaning of the transcribed word. One version of the Chinese record of this term was С5055, 15095 heiun (< γa-yiwon < *γaiun-gaiun) for “Milky Way”. So was called the Yueban district between the possessions of the northern Hun shanyu in the end 1st century AD. The term С12711, 10523 (悅般) Yueban (< ywat-pan) corresponds with the name of Ürpän/Ürpün district in the Bilge-Kagan epitaph (line 26) [Bernshtam, 1940, p. 76], and with the Chinese record of the ethnonym С3046, 10769 (悦单?) emyan (< iet-mien < *ermen~örmen?) in the Irtysh headwaters in the 7th century [Shiratori. 1902, p. 131-133], compared with the name of Urbün district near the river Chaa-hol, a left tributary of Ulug-Hema. The message about the fifth century Üeban country says that they were the tribes that before were controlled by the northern shanyu. Under attacks of the Han’s general Dow Syan troops, chariots and cavalry, the shanyu crossed Tszinwei mountains and fled west to Kangju. Üeban language and customs are Tocharian-Kocha (Ch. gaoche < kau-tsia < kocha, Khocha was the endoethnonym of Western Tocharian language speakers). They shave their heads bare, and trim eyebrows, they wash three times day, and only then eat their food. Their magicians could cause downpours, floods, and strong burans (snow storms - Translator's Notes) [Li Yanshou, ch. 97, p. 1292-1293, f. 14 b-15 а]. The so-called “northern" Hun (i.e. the Hun who did not accept vassalage of the Han state, located to the south of them) were located east from the Hun central lands. A military campaign against them, headed by the Han’s commander and courtier Dow Syan (?-97) and a military leader Gen Kui, ended in 91. Numerous skirmishes in different places lasted for three years, and Fan E could not connect isolated reports into a compressed and logically organized consistent annalistic story about the war. The author of the “History of Late Han dynasty, 25-220" lived and worked in the 5th century, more than three centuries after the events. This brings about completely different conclusions about their place and significance in the works of modern researchers [for example: Franke, 1936-1937, p. 300-301; Matsuda, 1955, p. 17-19; Bernshtam, 1951, p. 110; Malyavkin, 1989, p. 124-127]. Does not raise objections the (exaggeratedly enthusiastic) conclusion of Fan E: “Dow Syan and Gen Kui were ordered into campaign, and acting cunningly and making astounding plans, they joined, and, taking different roads, attacked the den of the shanyu by surprize. They pursued the routed and fleeing for more than three thousand li, they crushed their dragon den, burnt their felt yurts, buried alive ten horns (i.e. ten upper nobles), shackled the hands of queen-echji... And with victorious shouts they returned. The horrified shanyu slipped on felt clothes, and afraid to breathe, fled to the Usun lands" [Fan E, ch. 89, p. 1341, f. 366; Taskin, 1973, p. 98]. The "History of Northern dynasties" says that the significant part of Üeban people continued migration to the west from the area of modern Tuva to “Kangju”.Traces of this western part of the Üeban people is found in both editions of the "History of Tang dynasty": “The Tutuk commandery Üeban was established in the capital of the Shihanna (Chagani an) state in the "beautiful/rich" city of Yan (< yam) ruled by their king (wan). Separating as usual their tribe, was established a district Shuanmi (literally: “beautiful twins") [Lü Süy, ch. 40, p. 454, f. 40, compare Ouyan Sü, ch. 43b, p. 301, f. 40]. Chaganian (Saganian) was in the valley of the river Surhan (tributary of Pyandj), its center was approximately in the place of the modern Denau, 4-days trip from Termez [Bartold, 1963, p. 122-123]. Possibly, this western-most part of Urpens/Ubens is mentioned under a name Urva in the geographical part of the "Vendidad" (unless it is a late insert): “The eighth country is Urva, rich with meadows, a scourge of the country is their malicious rulers" [Braginsky, 1972, p. 49]. In the Chinese historiography, Shuanmi was a name of one of the provinces of Great Uechji (Pin. Yuezhi)-"Tochars" in Middle Asia in the second half of the 2nd century BC [Ban Gu, ch. 96а, p. 1163, f. 15а]. In this case more important is not the fact if the Urpenian Shuanmi coincides geographically with the ancient Uechji (Pin. Yuezhi), but the connection of Urpens with the Uechji (Pin. Yuezhi)-"Tochars”.This allows to established three stages of Urpen migration: Khingan, Tuva and Middle Asian. The main points of this east Tocharian-Kocha areas are also located: Tszinwei - Big Hingan to the north of the Shara-muren and the locality Kuyan - “Milky Way" (Heiun), which are repeating the conceptual, lexical and mythological aspects of the historical-mythological material of the legends, but precede them in time by more than a millennium. Thus, are established its ancient name (Urpen) and a custom of the population to completely shave their heads. This custom is known between many peoples of antiquity. Herodotus (IV, 23-24) wrote about “bold-headness" of seven-tribe Argippeians. “White-headed”,i.e. with completely shaven heads were the seven-tribe Uechji (Pin. Yuezhi)-"Tochars”. "Shaved hair on their heads the “seven-tribe Ephtalites or “White Huns" ("It is a tribe of Great Uechji (Pin. Yuezhi); it is said that they are a branch of Gaoche-Kocha”)[Li Yanshow, ch. 97, p. 1297, f. 23а]. In many cases “"bold-headness" was equivalent to Moon-headness. In the Persian legends, “Shahname" Taz (Türkic taz “bald”)was an ancestor of Kabul king-crescent Mehrab [Firdousi, I, p. 625]. The Bashkir fairy tale “Alpamysh and Barsyn-Hyluu”,probably an oldest Turkic version of the legend about Alpamysh, he was bald (Turkic taz), and had an image of a golden crescent on his occiput [Jirmunsky, 1974, p. 170]. A bold tribe existed among the Kypchaks of the Black Sea Coast. On the occiputs of some Kypchak stone sculptures were depicted scissors [Pletneva, 1958, p. 205; 1974, p. 41; Fedorov-Davydov, 1966, p. 178]. Notably, the Atabai subdivision of the Turkmen Tazes has tamga as sand-kalp “scissors handle" scissors [Karpov, 1929]. A Taz subdivision exists among Kyrgyz Kypchaks [Abramzon, 1971, p. 44, 46-47]. The Kirghiz epos “Manas" says that at the Djakyp toya (toya? - Translator's Note)from Kypchaks was eloquent Taz, ”... Kypchak-tardan Taz chechen" [Manas, 1984, p. 54, line 1089]. The terms “Taz" and “Kashka" defined a place of their bearers in the system of spiritual coordinates (reverence of the Moon deity) and had no relation to their appearance. In the Uzbekistan Fergana valley lived tribes Jeti-Kashka ("seven bald”)and Taz ("bald”). “Itti kashka" ("seven bald”)was a name of a Uzbek's Kypchak clan in the Namangan province [Shaniyazov, 1974, p. 44, 46]. The 14th century composition "Madjmu at-Tavarih" among other heroes has sons of a Kypchak Ak-Timur. They were called Jeti-Kashka. A belief even existed that in the very beginning this tribe ruled all Kyrgyzes [Abramzon, 1971, p. 46-47]. In many mythologies of the world the "magic" number seven was a most popular number. Its image is based on its interrelation with the seven-day phases of the Moon. The mythological symbols of the rising moon (crescent) also were a rib, an eyebrow and a bow. In the Oguz epos "Book of my grandfather Korkut", the Kypchaks are not mentioned. It has only a bogatyr Kypchak with an iron bow [Korogly, 1976, p. 270]. The Arab writer al-Omari names the Egypt's Kypchaks the moons of the ruler's retinues [Tizengauzen, 1884, p. 232]. The Milky Way could also be associated with White Tree of Life. In the Yakut fairy tale "Bosko", a handicapped youth, lonely and banished (a moon in the last quarter, crescent), addresses the Lady of the White Tree with a plea for rescue and revival. The branches chugged, and a life-giving rain, white as a milk, began to pour on the young man. A woman stepped out of the tree, and offered the young man to drink some milk from her breast. After he drunk the milk, Ürün-uolan found new strength [Potanin, 1893, p. 933-934, Gorokhov, 1885, p. 43]. Only in this key receives an explanation not understood till now the myth narrated by Rashid ad-Din and Abu-l-Gazi. During one of the campaigns of mythical Oguz-khan, time came to give birth by a woman whose husband had died. She went into a hollow in a tree, and gave birth to a boy who was given a name Kypchak [Rashid ad-Din, 1952, p. 84; Kononov, 1958, p. 43]. The hollow in the Tree of Life is a Milky Way fork, where ostensibly is born a new moon. The sacred shaman tree of the Yakuts, Khakases, etc. were called tor/tur. Many peoples held this tree as a road, a path, it was a symbol of connection between the world of a man with the world of the gods. In the form to turu/toro it was known to Tunguses and meant a way by which the shaman and his prayers rise to the sky [Shternberg, 1936, p. 123]. The Yellow Uigurs designated with this word (tyr) the shaman tree and the Milky Way [Malov, 1912, p. 128; Abramzon, 1978, p. 23]. In the Turkic antiquity clearly was a deity of childbearing Torlug, mentioned in the “Secret legend of Mongols" (para. 189-190) in connection with a birth Naiman Tayan-khan from a feeble old man and a young wife. In rallying call for the Kokotai funeral feast in the Kirghiz epos “Manas”,ch.Ch.Valihanov recorded the name Ak-tor (White Way, Milky Way) for a mythical ancestor of Kypchaks: ”... To the son of bald (taz) Aktor, to the brave Urbe, go, to Urbe who, being alone, achieved riches and strength... Batyr Urbe by nickname, and by name Munku (compare Mong. müngü “silver”,"white”)let him come personally! “[Valihanov, 1985, p. 97]. ...Numerous Kypchaks line their yurts in a raw. They lived peacefully in their bases. They were famous among people. [Koblandy-batyr, 1975, p. 65, 223]. A.Levshin noted the same Kypchak tamga [1832, p. 134-135], the same tamga is also recorded for Karakalpak Kypchaks. One of the tamgas of the Kangly tribe, who in an antiquity lived together with Kypchaks, was the same pole next to the image of a full moon with beams of rays. Their uran (battle cry - Translator's Note)was bai-terek ("sacred tree") [Su Beihai, 1984, p. 139]. Detour about Moon and Hare. Many peoples in antiquity, from the Far East to Africa, associated dying and revived moon with hare, who is changing its color seasonally, like dying and returning to life again (and equally, apropos, and with shadding his skin snake~dragon). In an ancient Chinese myth a white hare lives in the Lunar palace, and year around he pounds in a mortar immortality confection. Next to him grows a tree which grows back untouched however much was cut [Yuan Ke, 1987, p. 158]. With the same idea of immortality are connected these images in the Namakua tribe (Hottentots) in Africa. In the old times the Moon wanted to send a message about their immortality to the people, and the Hare volunteered to carry her words: “Like I am dying and I return to life, you will be dying and returned to life”.But the silly has forgotten these words and, having galloped to the people, told them: “Like I am dying and do not return to life, so you will die and never return to life”.Upon learning of it, the Moon became furious and threw a stick at Hare. Other African tribes had also known this legend [Frezer, 1985, p. 34-36]. This myth underwent an original transformation among the Türks of the First Kaganate, whose dynastic coalition consisted of a Kagan fraction (its symbol was a White Deer Golden Horns, i.e. the Sun) and a Katun fraction (its symbol was Snake/Dragon of fertility and prolificacy), deriving its origin from the gynocratic Uechji (Pin. Yuezhi) “clan of the Moon”.One of the main deities of the Uechji (Pin. Yuezhi) pantheon was a Milky Way Kuyan (and the essence of White stream, Tree of Life). The Turkic term kuyan/koyan “hare" was homonymic with this symbol. Are created you by white sky! Transformed into a white hare! Is like the half of the Moon! You travel in the clear sky! And receive a shadow from a white birch! It is also noted that the image of a White protector, in a birch branch with a stretched piece of shaved sheepskin with sown-on head of a hare, was a main object during the prayers by Pürüts and Kaska ("bald”)to him. The image was usually stored on a roof or on a corral fence. The prayers were conducted on a bank of a river under a birch, and the shaman was kamling (performing spiritual ritual - Translator's Note) in a female fur cap [Potapov, 1969, p. 28-29]. ... All this material shows that the Kypchak “column" tamga is a tamga image of the Tree of Life - Milky Way, in a bosom (in a branch) of which arises a new moon. But the tree which gives birth can only be a woman, and without a man a conception of new life is impossible. Therefore near the tree of a feminine gender (as a rule, a white birch) appears a man-tree (cedar), as for example, was in the imagery of early Ordu-balyk Uigurs in the Northern Mongolia. 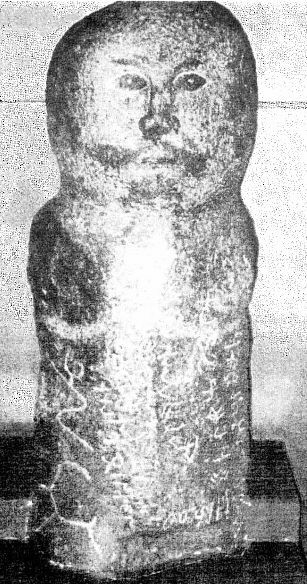 Accordingly, the Kypchaks' tamga adds one more “column”.M.S.Mukanov and other researchers have noted the common main tamga of the Kypchaks in the Kazakh Middle Juz as a pair of “columns”.Their uran was ay-bas ("lunar head”)[Mukanov, 1974, p. 58 (Vostrov V.V., Mukanov M.S. Clan and tribal structure and migrations of Kazakhs. Alma-Ata, 1968.)]. The name of Kypchak Urbe or Urbü, of the toponyms Urpen and Urmen survived in the nomenclature of the Bashkir ethnonyms: Ürman (compare Ürban), Ürmi (compare Ürbi), Ürmaty (compare Ürbeli). In the Bashkir shedjere, the mythical Ürmi-khan on a hunt tries to shoot a swan, which turns into a gorgeous girl, and from a marriage with her is born his son Ürmaty. In the Western Tabyn genealogical legends their Ürman ancestors come from Mongolia, from the Altai area. The Bashkir clan Urman-Gere (~Ürman~Kerei?) had a clearly Kypchak tamga as a pair of “columns" [Kuzeev, 1973, p. 120-121, 270-271, 332, 369], and this last circumstance directly connects the origin of the name and ethnonym Urman-Gere with the Great Khingan, also called Altai and Eke Altai “Great Altai”. The reconstruction of real sound in the Chinese rendition of the surname Tuthaka Üyiboli was attempted many times. In the review of J.Marquart's book “Über das Volkstum der Komanen" (Berlin, 1914) P.Peliot supported the reading Yür-beli [Pelliot, 1920, p. 161], but later inclined to a more, in his opinion, probable reading Ülbäri. Polemizing with J. A. Boyle about original sound of the surname of the Kypchak queen of Khoresm Terken-hatun, he came to opinion that in fairly late edition of the Kazvini Persian text “Tarih-i djehan kusha" which J. A. Boyle used in his English translation, was mistake: should be read Ürbälian ("Urbelian”,"Urbelians”), a metathesis variation of the term Ülbäri [Pelliot, Hambis, 1951, p. 108]. The P.Golden's detailed article in search of the original correspondence of the Chinese record Üyiboli argues in favor of its initial sound Ölberli [Golden, 1986-1987, p. 5-29]. Worthy are also the other opinions (S.M.Ahinjanov, B.E.Kumekov). The subject is not a petty academic interest, but establishment of ethnic interrelations of a large spatial and temporal scale. 3. С14545, 4419, 4849, 679 Venerbeli [Sun Lian, ch. 124, p. 1450, f. 4а], etc. The first hieroglyph 14545 “wen" in last transcription (Wenerbeli) is obviously erroneous, but this does not change the picture. Finding the Turkic correspondence of the Chinese transliteration of this term is preferred by addressing the Turkic material, which in this case is the Kirghiz epos and Bashkir ethnonymy. It forces to return to the correspondence of this transcription with the form Urbeli, which P.Pelliot unfairly considered to be a secondary form. To the eponim Urbü also ascends the message of the Ipatiev annals under the year 1152 about the name of "Kipchaks-Orplüevs". This does not deny the existence of other forms (Ölberli, etc. ), derived from the initial Urbü. Returning to the designations of the Milky Way, onother of them from the Atlantic ocean coast to the east end of the Central Asia is "Straw (hay, chaff, peas and such) Way" or a "Way of the straw thief”.This appellation is found in the folklore of the North Caucasian descendants of the ancient Uechji (Pin. Yuezhi), eastern Iranian Ossets. It says, in particular, about an inhabitant of heaven by the name Arfan (compare Orpen above), who stole straw from another inhabitant of heaven, but in a flight scattered it on the night sphere. The way of his flight was sown with straw. Therefore Ossets call the Milky Way “Arfan Trace" [Abaev, 1958, p. 175]. Turkic main names for the Milky Way are Saman ugrusu “Thief of straw" and Saman yolu “Way of straw”.Uigurs call it Saman-yoli, southern Kazakhs call it Saban joly “Way of straw ”,Uzbeks call it Somon yul , all “Straw Way”.The Milky Way of the Slavic peoples is quite often connected with a mysterious term kum (compare above qum) and “straw": “Kumova slama”,"Kumov way”,"Kum from kuma has stolen straw" and such [Nikonov, 1980, p. 242-263]. To same group should be attributed an annalistic identification “Cumans means Polovetses”.The term Polovets acsends to the old Rus polova “straw”,"chaff”.This is an old Rus adaptation-calque of the word Kuman, acsending to the designation of the Milky Way, but not at all to the yellow color of the straw, as is accepted from the hand of A.Kunik (1854) and survives to this day in science. The important and challenging Kypchak problem drew a large number of researches. Many valuable and useful facts in resolving specific and general problems of Kypchakology are contained in the monographs of J.Marquart (1914) and S.M.Ahinjanov (1989). A careful analysis of the Turkic lexicon connected with the term Kypchak was made by A.N.Kononov (1976). A new solution to the question of Kypchak origin was offered by S.G.Klyashtorny (1986), who thinks that Kypchaks are identical with the tribe С3962 Se (< siet) of the Se-yanto confederation and homonymous Kaganate (629-647) in the Mongolia territory. Klyashtorny reconstructs transcription Se in the form Sir, and identifies Sir with the name Sir in the ancient Türkic runiform texts. The term Kypchak, in his opinion, means "unsuccessful", "downrodden", "unlucky". In the eyes of the writer of these lines, each point of this fearless hypothesis requires additional argumentation, more thorough than offered in the article. The runiform spelling assumes reading Shir or Sir. Its Chinese transcription is С8748 shi (< siet < shir) and therefore the first reading is more preferable. There is also its Türkic equivalent Arslan "lion". The Middle Persian term Shir is a religious term, it came to the Türkic society with acceptance of the Manichaean creed by the leaders of some Türkic tribes in the 7-8th centuries (see below, section 2). The Klyashtorny hypothesis should overcome a chronological discrepancy: In the Mogoin Shine Usu inscription, where for the first time was mentioned the term Kybchak, the subject is the events immediately preceding the creation of the Second Uigur Kaganate in the middle of the 8th century, and the Se-yanto Kaganate fell a century earlier, and the Kagan term Se (~Ser!) it is not mentioned anymore anywhere. This material, even partly considered satisfactory, does not support the Klyashtorny hypothesis. The word qum on the Türkic linguistic soil was already de-semantized (lost its initial semantics - Translator's Note) in the extreme antiquity, it also had no meaning in the Slavic languages. To fill the word qum with a sense, were found more or less homophonic and common words, for example, quma "concubine" (Vasmer notwithstanding - Translator's Note). In the 13th century name Kypchak (Kbdjak) was given to the grandson of Jochi-kasar (brother of Temuchin), born from concubine (kume) [Rashid ad-Din, 1952, vol. 1, book 2, p. 53]. Following the idea of the color semantics of Kypchak, Kumak, and Kumyk, and noting that the basic morpheme of these words is qum, A. H. Kononov wrote: “It can be asserted with significant dose of confidence that ethnonyms Kuman, Kypchak and Kumyk (genetically closely related tribal formations) acsend to to the same root (*qub) and represent various forms of phonetical-morphological development of this root" [Kononov, 1976, p. 109]. D.G.Savinov is leaning towards this idea, in his detailed work are established main stages in the history of Southern Siberia early Kypchaks based on the archeological material [Savinov, 1979, p. 56]. Probably, the solution of the unclear term kum is hidden behind the name of Hom (Haoma) tree of the ancient Iranians. In “Bundahishnu”,a white resurrecting tree Hom grew in the Ardvisur spring of the World sea Frakhvkard (or Vourukasha, Varkash). During the world resurrection from this tree will be prepared a drink of immortality [Chunakova, 1997, p. 120, 289-290, 303]. In the “Avesta" it is a hallucinogenic drink and an elixir of immortality, sometimes personified in the images of deities (for example, it is an embodiment of the order in space and society - Mitra). The most ancient cult Homa/Haoma had been adopted by different religions. Zaratushtra eulogizes it because it gives health, restorative force, knowledge, enthusiasm, ability for defense, power, passion. It was prized by Scythians and Sarmatians. Its trace survived in the Ossetic name for the hops hum-allag (Khum-aellaeg < *hauma-aryaka “aryan hum”)[Toporov, 1992, p. 462-463, 578-579]. Survived the traces of its use by early Türks. A genealogical ancestor of the Kumandy/Kubandy seok in the Altai was Kuman. In the Kumandy/Kubandy language a hop cone is called kumanak (compare Shor kubanak, Altaian kymynak “hops”,Barabian, Sagai, kumpak “hop cone”,"hops”)[Potapov, 1969, p. 59; RSl. II, stlb. 1044, 852, 1035, 1055]. The ancient Indian personification of this cult was the god of the moon Soma. The moon grows as it is filled with immortality drink, and fades as it is drunk by the gods. In “Rigveda" hymns (I, 91, 6) Soma was addressed as "Lord of trees”,it was a World tree [Toporov, 1979, p. 289]. In the myths of ancient China a beauty Chane purloins a drink of immortality from her husband Hunter and flees to the Moon [Yuan Ke, 1987, p. 311]. Analyzing the term Kypchak, is relevant to remember that its standard Chinese transliteration in the 13th century was tsincha (kymchak), and the annalistic name "Kypchak road", which terrestrial coordinates are not yet established, is first of all the Way of Straw, i.e. the Milky Way. Kypchaks (Kumans, Kypchaks) preserved the image of the Milky Way, they were "Milky Way'ans". The existence of theMoon and Milky Way sacral symbols in the Kypchak society can be viewed as a Türkic realization of the Uechji (Pin. Yuezhi) pantheon. The term Kypchak was alloethnonym (exoethnonym - Translator's Note), given by their neighbors, reflecting the features of a cult of its bearers. The combination Urbe/Urbü-Kypchak already assumes the existence of others Kypchaks, not Urbelians (compare, for example, typologically similar Türk-Shir and Shir-Qarluγ in section 2). In 1913 G.Ramstedt published a translation of Eletmish epitaph monument he found in 1909 in the Mogoin Shine Usu depression (valley of the Selenga river), the second Kagan of the Uigur state (747-759) [Ramstedt, 1913, Ramstedt, 1912]. In the fourth line of its eastern side is said that when Eletmish was 25 years old, the Türks-Kybchaks ruled Uigurs for 50 years. And that was in the Türkic state ("when Türks-Kybchaks (Turk Qi'bchaq) dominated us for 50 years in the state of Türks on my twenty sixth year of life... ”). The chronological definition of the historical epoch in both Eletmish inscriptions (lifetime's Terkhin and posthumous Selenga) has a conditional character, a constant trait of all ancient texts. Only a concrete statement about Eletmish age matters. In the Terkhin inscription he informs that he began uprising against Türks at the age of 28 years. And the year of a twelve-year animal cycle (Year of the Snake, 741) is also named, i.e. the exact date of chronological reading is given: “At my 28 years, in the Year of Snake, I brought disorder to the Türkic El, I destroyed it (line 21). So, Eletmish was born in 715/716. The ruler of the Türkic state these years was Mochjo-Kagan (691-716). С408, 10167 Mochjo (< mək-tiwat < *bektüir? or: mək-tsüer < *beg chor?) is a pre-kagan time title-name of this ruler, under which he was known before the enthronization, during the rule of his predecessor, his senior brother Kutlug (Ch. Gudolu), called Elterish (682-691; it was Elterish the First) in Turkic inscriptions. According to the Old edition of the “History of Tang dynasty”,Mochjo in the 689 headed the Türkic troops in an attack on the northern areas of the Tang state [Lü Süy, ch. 183, p. 1322, f. 136]. During enthronization the Türkic Kagans received a new title-name, but the Chinese annalists, as a rule, to avoid an impression that the subject is another person, preferred to call them by their former name, only occasionally adding to it the actual Kagan throne name. Such throne name of Mochjo was С14035, 8754, , 12466 Sede [li] shi <γiet-d'iet-[lyi]-sie < Elterish. In the message of 712 he is called Ashina Sede [li] shi Mochjo/Elterish Bektur (Beg chor? ), of Ashina (clan) [Tsen Chunmian, 1958, p. 376]. After a victory over hostile in relation to the Tang Kidans, in 697 the Chinese empress presented him with a bloated Chinese title, which, however, did not overlook the Türkic word elterish: Te-tszin Sede-lishi Da shanyu li gun bao go kehan “Advanced out of sequence to higher rank Elterish and Great shanyu-Kagan, meritous and grateful by the Tang state [Ouyan Sü, ch. 215а, p. 1503, f. 11а]. In the text of the large stele of the chancellor Tonyukuk he is named Kapagan-Kagan (Tonyukuk, 51), and in the Ongin inscription (line 4) Kapagan Elterish-Kagan (Qapaγan Elteris qaγan elingä qilintim: “I was loyal to state of Kapagan Elterish-Kagan”). This was Elterish the Second. One more Kagan by the name Elterish was a leader of Basmyls from a clan (a tribe?) Ashnash/Ashinashi (compare the name of the military commander Ashnas at-Türki in the "History" at-Tabari), closely related with the kagan Ashina, and participating in the affairs of the kagan horde-court. On the eve of falling of the Second Türkic Kaganate he, with a support of the Uigur ruler-yabgu and Karluk ruler-yabgu aspired for a role of a founder of the Basmyl Kaganate, a new "gatherer of the El-state”,Elterish, and for a short time he really became that. In the 748 he was raised as a Kagan under a name Hela Pitszya kehan/Alp Bilge-Kagan [Ouyan Sü, ch. 217b, p. 1530, f. 9а]. In the other place of the annals he is called Sedeishi kehan/Elterish-Kagan [Ouyan Sü, ch. 217а, p. 1521, f. 3a]. A modern researcher Tsen Chünmian [1958, p. 639, 1046] calls him Sedeishi hela pitszya kehan/Elterish alp bilge-Kagan, and Se Tszunchjen [1992, p. 582] calls him Hela Sedeishi/alp Elteris. In the 744 he was overthrown by former allies, and fled to Beitin (Beshbalyk), from where, as suggested by Tsen Chünmian [p. 470], in the fourth moon of the fifth year of the Tian-bao period (746) he sent to the Tan court an embassy from the "Basmy lstate" [Van Tsinjo, ch. 971, p. 11412, f. 15b]. He was Elterish the Third. Of the three Kagans with a title elterish, only Elterish the Second (Mochjo) had a direct relation to the immediate history of the Second Uigur Kaganate. By the 712-713, the Mochjo empire extended for 10 thousand li from the east to the west, and had a 400-thousand army. All males of the empire, from juvenile to old men, were enlisted as soldiers. Mochjo already could not rule such a monster, moreover, after twenty plus years' rule “he was becoming sillier and ferocious; the tribes mutinied and started seceding”,leaving under Tang protection. A special concern for the kagan court-horde brought the centrifugal inclination of the “nine surnames" Tele (< tegreg) [Hamilton, 1962, p. 25-28] union, i.e. of the Tokuz-Oguzes. The “root" tribes of the “nine surnames" confederation were not nine, but seven (compare seven Uechji (Pin. Yuezhi) tribes), two were considered associated tribes. The compiler of the encyclopedia called “Perused by emperor during Taipin sin-go period, 976-983”,writes: “Their nine surnames are: 1) Hueihe (Uigur); 2) Pugu (Buku); 3) Hun (Hun); 4) Baegu (Baiarku); 5) Tunlo (Tongra); 6) Sytsze (Siker); 7) Tsibiyüi (Kibirgü?). Seven listed tribes [these are “nine surnames”]”.From the time of the beginning of the Tang dynasty (618), the “Histories" read: “8) Atszesy (should be: Abusy); 9) Gulun Ugusy ”. "These two surnames became of equal rank with the seven surnames after Tian-bao period “(742-755) [Yue Shi, ch. 199; Van Pu, ch. 98, p. 1744; Tsen Junmian, 1958, p. 714]. The composition of the seven and nine tribes in the Oguz confederation was not static, but the important message of Yue Shi is used in the following discussion. In the autumn of 715 occurred a Turkic punitive action against the “nine surnames”.The Old edition of the “History of Tang dynasty" reads: “in the autumn Mochjo fought the leader of nine surnames Abusy north from the Desert. Nine surnames were badly defeated. Had died a multitude of people and cattle" [Lü Süy, ch. . 194а, p. 1442, f. 14а]. The New Edition reads: “Mochjo began a war with nine surnames. He fought north from the desert. Multitude of people and cattle have died. Sytsze with others came and submitted [to Tang]. Emperor gave all of them ranks" [Ouyang Xiu , ch. 215b, p. 1504, f. 13а]. They stayed in the area between Lianchjou and Ganzhou (Gansu province, “Gansu corridor”). A detailed discussion of the events during that foggy time is a subject of a separate discourse [for example, see Kamalov, 2001, p. 63-67]. The relations between Oguzes and Tang territorial administration were so opposing that Hushu, an Uigur Khangai commander, after 727 chose to return to the Türks with his people. He died there a natural death, and his son Guli Pejlo became a founder of the Second Uigur Kaganate. 2) at that time the “nine surnames" Tele (Oguz) tribal union actually had seven tribes. ... My sovereign sent me: “Happily go! " - [he said]. You, seven relatives, do not separate! I, Ton [yukuk], put in order (created) [the state?]. For my foresight (for of my prediction? For my advice?) houses and cattle corrals for me... "
The full agreement of the main facts of the historical descriptions and this inscription does not leave any doubts that the subject is the events in the autumn of 715, when after a bloody massacre staged by Elterish-Kagan (Mochjo), Oguzes did not see any other options except for secession from the Türkic Kaganate. Despite the imperative tone of the Tonyukuk inscription, they "separated", crossing the desert to the area between Lianchjou and Ganzhou to come under protection of the Tang's "Red River Corps" (Chi-shui tszun). Personality of Tonyukuk, the author of the Choiren inscription is important. Common for the Large inscriptions from Husho Tsaidam and a number of others is a stylized tamga image of a mountain goat in the top part of the monument, and a snake posed for attack in the bottom part of the monument. The mountain goat is a graphical euphemism for the White Deer Gold Horns, i.e. the Sun, a symbol of the Kagan fraction in the dynastic coalition of the Kaganate. The snake in a menacing pose is an euphemism for a fertility dragon and the Moon, a symbol of the Katun fraction in the ruling dynasty. Such standard arrangement of the tamgas was violated only once. On the right side of the Chojren inscription at the top is the Katun three-headed Snake , and under it is depicted the Kagan mountain goat (Fig. 3). For the ancient Türkic monuments this case is unique. Probably something similar (in verbal form) existed in early Middle Ages among the Türkic population in the Volga basin. In 922, the Arab traveler Ibn Fadlan learned about a group of Bashkirs worshipping Snakes [Kovalevsky, 1956, p. 131]. This story is incomplete. In the first quarter of the 13th century, Mongolian army came there. And what it have seen, described by an unknown Rus author of the 16th century in “Kazan history”,"And many say, before that place for long was snakes' nest, known to all inhabitants of that land. The terrible Snake living there is large and terrifying, and has two heads, one snake's, and the other head of ox." [Moiseyeva, 1954, p. 47]. Fig. 3. Runiform inscription from Choiren (Northern Mongolia) with tamgas. S.G.Klyashtorny compared tamga as Snake with tamga of the Ashide tribe from the tamga list of the “Tang review" . Ashide were a noblest tribe of the Türkic Kaganate. They were related to the Kagan tribe Ashina. Klyashtorny writes “Probably, originally Ashina and Ashide together constituted a dual endogamic system, so well-known at Türkic and Mongolian peoples. The relations of kinship between them were also preserved during this epoch" [Klyashtorny, 1971, p. 94-95]. Accepting these positions, we shall expand on this subject. The Ashide Tamga is completely identical with the Uechji (Pin. Yuezhi) - Kushan tamga of the king Bakarna and all previous Kushan kings. The first Kushan king, alongside with that tamga, also had tamga [Akishev, 1984, p. 109]. These are not arrows reflecting three or a four component society, but three or four heads of the mythological Snake/Dragon Aji Dakhak, as stated in Avesta (Yasht V. Ardvisur, IX, 34). The Middle Persian form of this word is ajdahak “dragon”.The dragon was associated with Moon. In the western astrology the Moon in first quarter was called “head of a dragon”,and in the last quarter was called “tail of a dragon”.Precisely the same was in the Chinese astrological compositions: lun show “head of a dragon" and lun wei “tail of a dragon”.In the middle Persian texts from the East Turkestan the combined phases (i.e. the Moon) were called do Ajdahak “two dragons" [Chavannes, Pelliot, 1913, p. 161]. The image of dragon Azhdahak has been accepted by Zoroastrianism, and since the third century by Manichaeism, where it carried functions of a king of Darkness. The spread of Mani doctrine went on a global scale. In the beginning its preachers were Persians and Sogdians. Manichaeism had widely spread in the Türkic world (Section 2). In this case, the Manichaean tradition coincided ideally with the Uechji (Pin. Yuezhi) myth, and that should be viewed as evidence of connections between Ashtaks and Uechji (Pin. Yuezhi) at their roots. They also were an acceptant of another main Uechji (Pin. Yuezhi) symbology. The district, where after the fall of the Se-Yanto Kaganate in 648, was placed Ashide Shitszyan Sytszin (Ashtak Chykan-erkin) with his people, began to be called Tsilyan/Kiglen “Cloud chariot of water and fertility “[Ouyan Sü, ch. 217а, p. 1521, f. 2а, Tsen Chünmian, 1958, p. 259, opposing view: Malyavkin, 1981, p. 103]. Uechji (Pin. Yuezhi) main sacral symbols Kuyan and Kiglen were reflected in the Ashtak toponyms Kuyan (Ch. Kuyan-gu) and Kiglen (Ch. Tsilyan (Qilian)) [Van Pu, ch. 72, p. 1307]. From the position of the maternal law, on which the Uechji (Pin. Yuezhi) society being a gynocratic society has to be based, a husband settles in the house of his wife, i.e. the marriage was matrilocal. Remarkably and importantly, in the immediate pre-history of the Second Kaganate the Ashtaks critically selected a suitable candidate for the Kagan post, from the traditional Kagan tribe Ashna (Ashina), they were bringing the applicant over, and were raising him to the Khan throne. The first two Kagans did not meet the high requirements of the Ashtaks to the Kagan, and were rejected almost immediately after enthronization. The marriage was matrilocal, the Kagan was treated as a necessary figure, but of the second plan. Speaking about successful military actions of the Ashinian Kutlug (future Elterish the First), the Bayin Tsoktin Tonyukuk monument inscription (lines 5-6) reads: “I said, should we force him (to become) Kagan? ”.I thought: it is said, that if from afar and are seen (lit., known) fat bulls and lean bulls, (still they) do not know which one is a fat bull and (which one is a) lean bull. Because the Sky granted me knowledge, I forced him to become Kagan”.His vision of the Kagan position the wise adviser Tonyukuk defines with the words ascribed to the lips of his military opponent: “Its (Turkic El) Kagan is a hero (alp), his adviser is wise (bilge)" (line 10). Kagan, from the Ashtaks' point of view, had only executive military function. The relation of the Kagan - adviser was defined in a proverb that survived till the Mahmud Kashgari days: alp cherigda, bilge tirigda - “a hero [is prominent] in army, a wise [is prominent] in life" [DTS, p. 144]. For this reason in Cioiren inscription the katun tamga is placed above the kagan's tamga, and above the third and fourth lines of the Bayin Tsoktin inscription (in the top part of the Tonyukuk stele) is depicted a female triangle with the sharp end down, with a total absence of other symbols. The whole life of the First Türkic Kaganate has also passed under umbrella of she-dragon, one of the embodiment of which was a she-wulf. The she-wulf - she-dragon was considered to be not only a mother and wet nurse of the Pra-Türk, but also of the subsequent Kagans, evidenced by the Bugut monument with a sculptural image of she-wulf, feeding a human child in the top part, and the wolf banner above the Kagan court-horde (Fig. 4). Fig. 4. Bugut monument (Northern Mongolia). Obvious by all key indicators the Uechji (Pin. Yuezhi)-type of the Ashtak Türks, and their predominating position in the Second Türkic Kaganate, which included the possession of “nine surnames" (among them Uigurs), with a large doze of probability force to assume that the text of the Mogoin Shine Usu Uigur monument calls Kybchak Türks the Ashtak Türks. The impression is that in this case the term Kybchak is not an ethnonym, but a name designation of the part of of the Türks that was directly connected with the Uechji (Pin. Yuezhi). In a similar way could also be designated the Uigurs. The Kypchak myth discussed above coincides with the Uigur known versions of a genealogical myth about a birth of Uigur pra-genitor by the name Buku, Buka or Oguz (a bull whose horns symbolize arising moon, crescent) in a hollow of a tree or in some swelling hillock ("a pregnant woman") between two trees, a cedar and a birch [Huan Wenbi, 1964, Sun Lian, ch. 122, Juvaini, 1958]. The same version is laid out in the Rashid ad-Din work. "Byogü (Bukü)-khan in ancient times was a great sovereign, to whose memory Uigurs and many other tribes pay full respect and say that he was born from a tree. This Ynanch-Bilge-Byogü-khan was a reputable king and had sons. His senior son had a name Bai-Buka ("Sacred Bull"), the Chinese kings called him Ai-wan" [Rashid ad-Din, 1965, p. 300-301]. Wan is a Chinese word meaning king, the Türkic word ai means the Moon. In a case with Ashtaks and Uigurs, the term Kypchak remained only a designation of a common ideological a level, it did not stuck to them as an ethnic name, therefore the words Türk qjbchaq from the Eletmish inscription should be perceived as Türks-Kypchaks or the Türkic Kypchaks, keeping in mind that the mythical ancestor of Uigurs was in the same sense *Uigur-Kypchak or *Uigurian Kypchak without an ethnic semantic in the term Kypchak. Kypchaks (in ethnonymical or in nominal meaning) could be Türkic tribes of various ethnical background, whose pantheon was dominated by the discussed complex, the part of of the Türks that was directly connected with the Uechji (Pin. Yuezhi). The words of T.A.Jdanko, already noted by D.G.Savinov, can describe the period of early “Kypchakism": “Ethnonym “Kypchaki" at different historical stages and in different geographical areas applied to tribal clans ethnically different from each other... “[Jdanko, 1974, p. 8; Savinov, 1979, p. 70].